Purchase this high quality art print expertly produced on 8.5x10 inch (28x43 cm) 100% acid free heavy duty premium paper. When matted and framed it makes a beautiful addition to your décor. This is the artwork that started the the photographer-artist (or should I say artist-photographer) side of my work, at least for public display. My previous experiments did not give me the look I was comfortable with. When I finished this one after about two dozen versions I knew I had something I wanted to show others. At first, it started as a window display of ladies shoes at a high end boutique. That changed after I took the picture in Rome, Italy on the fabulous Via Del Corso shopping district while waiting for my wife inside this store. The window displays for each store in the area were beautiful works of art in my opinion; so I took a single shot of this window with shoes seeming to float among the handbags. The original did not look good because I took it looking through the smoke colored glass window pane. I liked the shapes and composition but the color could not be corrected and that is when I went to work. First I wanted to just salvage the image, then I wanted to somehow change it. I spent scores of hours experimenting the possibilities. That is why I made so many versions. Once I got what I liked and shared it, the reactions have been great especially when my friends were clear I was not interested in wearing the shoes! Frequently I find myself waiting for my wife in fancy shoes stores so I suspect there will be a whole line of lady’s shoe art available here. Please stay tuned. 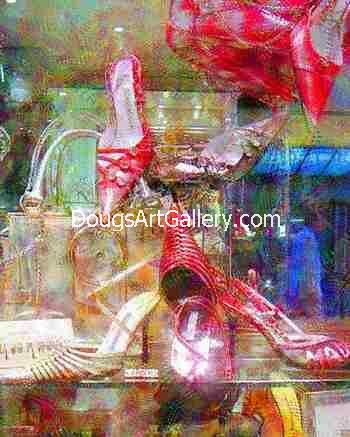 The Red high heels lyrics by recording artist Kellie Pickler on her album Small Town Girl has generated a lot of interest in this print. Click here to leave Women That Love High Heels for more links to artistic styles, artists and their online art galleries, art prints and art posters. Browse the links found at the bottom of Home Page. Do you like Women That Love High Heels?